While it may well be geared to the demands of the 21st century traveller – both business and leisure – Innsbruck’s Goldener Adler is undoubtedly one of the most historic places to stay in the whole of Austria. Dispensing hospitality for over 600 years, through its doors have passed the likes of Goethe, Sartre and Emperor Joseph II. Indeed, even Wolfgang Amadeus Mozart is known to have stayed at the Goldener Adler during his travels through Austria. With only 31 guest rooms it remains one of the more modestly-sized hotels in Innsbruck and almost certainly no larger than when Andreas Hofer, the Tyrolean freedom fighter, gave a speech to the townsfolk from what is now the Andreas-Hofer-Stube in which guests can sample local cuisine. 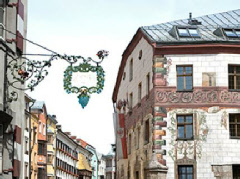 Located at the heart of the old town, much of Innsbruck’s main attractions and museums are within easy walking distance.